Wedges have an attitude. They’re complex. 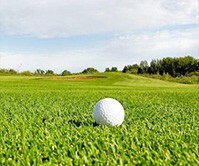 But given their job description, golfers cannot imagine walking on to the course without them. Wedges are the scoring clubs and, often, the tools needed to save a score after an offline shot. They can deliver the ball to the green from fairways, sand, rough, or hardpan across a wide range of distances. What follows is a review of a few of the latest wedges from the top manufacturers. Often, there are too many variations to cover, so it’s best to consult a professional to find the right lofts and grinds for you and your game. 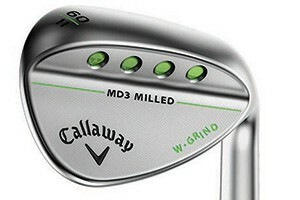 Callaway is making some headlines right now with their new MD3 wedges – available for pre-order on 8/14/2015. While we didn’t get a chance to check them out in person, we can share some of the buzz from tour players and others. To start, the wedges will come in a couple finishes – both of which look great. The Satin Chrome and the Matte Black finishes both feature subtle lime-green highlights which show up well and set the clubs apart without being too much. There are three different sole grinds available. The C-grind is for sweepers of the ball (shallow swings) or for very firm conditions. The W-grind is the opposite end of the spectrum with a wide sole and additional bounce for soft conditions or to help people with a steep swing. The S-grind falls right in the middle, making it a versatile all-around performer for most golfers. 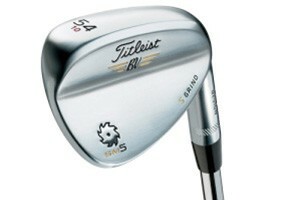 The most interesting feature, though is the use of progressive groove configurations on each of the wedges. For pitching and gap wedges (46 through 52 degrees), the “30V” grooves feature sharper edges on a thinner overall groove for control on full and partial shots. The “20V” grooves seen in the sand wedges (54 and 56 degrees) are designed to provide solid performance on full shots, but also work well from bunkers. The “5V” grooves, then, that are found on lob wedges of 58 or 60 degrees are the widest grooves with the softest edges to provide a soft touch from greenside lies, including rough. The 588 RTX 2.0 is Cleveland’s answer to the need for enhancing control with increased spin. It does so by adding their Rotex face pattern through a micro-milling process across the entire face. Add in the sharpest grooves allowed by the USGA, and the club delivers exceptional spin on close-in shots. The wedge comes with three sole grinds and 18 loft options, making it a chameleon capable of matching any need for any golfer. The Full Sole grind features three dots on the toe to help with easy identification and provides additional bounce while providing the ability to open up the clubface for lofted shots without raising the leading edge off the turf. The Standard Bounce grind (two dots) is a versatile middle performer while the Low Bounce (one dot) has the least amount of bounce with the trailing edge, heel and toe ground down to make it very versatile in the right hands. Available in a myriad of choices, there is also a version with a cavity back design. The 588 RTX 2.0 CB provides additional forgiveness for full shots on a slightly larger clubface with perimeter weighting. When it comes to wedges, there seems to be Vokey and, well, everyone else. With six sole grinds and twenty-one loft/bounce combinations ranging from 46-62 degrees, the SM5 is capable of tearing the ball out of the darkest, steepest, and sandiest corners of the course. Set them shut, square, or open, and they perform. The wedges come in six different “tour-proven” sole grinds (S, M, K, F, L and T). Perhaps a bit much to fully describe here, just rest assured that there is something to fit your game. The other differentiator for Vokey is what are called TX3 grooves that are deeper and push the boundaries of USGA limits than ever before. 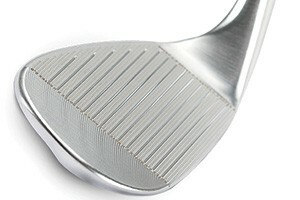 Add to that a finely milled face roughness and these wedges provide a tremendous amount of greenside spin. There is a reason Vokey designed wedges are so famous and popular. That reason has always been performance and the SM5 is no different. 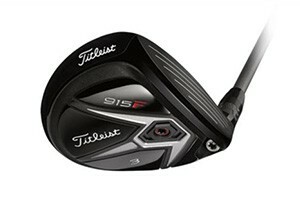 The clubs are more visually appealing too, with three finishes: Tour Chrome, Gold Nickel, and Raw Black. Also available are a wide variety of personalization options such as custom stamping and colored paint fill meaning you can get any phrase, initials, or message stamped onto the back of your wedge in just about any color. MP-T5 is Mizuno’s versatile and all-purpose solution for wedging every conceivable scenario — from low linksy skippers to those growling flops. 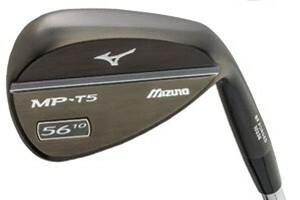 The MP-T5 boasts Mizuno’s hallmark model good looks and feel. It offers one of the softest forged faces with all terrain-versatility. The package offers 5 sole grinds, and 15 additional custom options to its 10 loft/bounce combinations extending the original 50-60 degrees to 49-62 degrees. The relatively large face coupled with a weighty sole lowers the CG, supplementing full swings whereas it alterable spin orders full shots to stop almost exactly where they fall. The heavy head maintains its balance exquisitely, offering a light touch that delivers full feel feedback even on partial shots. A pioneer in matching groove design to the loft, the MP-T5 contiues Mizuno’s innovative approach by offering greater spin control — lower on full shots and higher on short ones. The notably oval shaped face complements the sleek sole and overall head design allowing every loft to produce high, soft pitches. 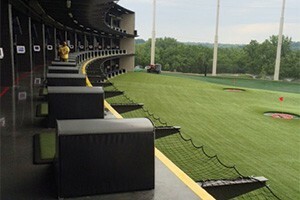 Topgolf, in the behemoth new building at 107th and Nall Avenue in Overland Park, looks nothing like a driving range from the outside – and for good reason. Topgolf is much more than a place to practice your drivers, irons, and wedges. 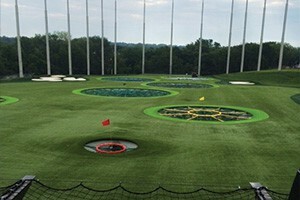 In fact, more than 50 percent of the people who walk through the door of Topgolf facilities around the United States have never swung a golf club, said Marissa Olberding, marketing manager for Topgolf in Overland Park. “We cater to a very large demographic,” Olberding said. Families, young people, men and women of all ranges of golf ability or none at all play at Topgolf, which opened in late June, Olberding said. They can also play pool, foosball or shuffleboard. But what people do most at Topgolf is eat and drink. 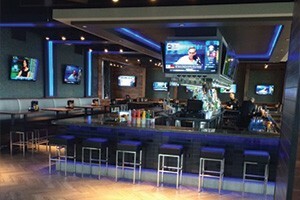 The mammoth, three-store bar and restaurant has room for nearly 1,400 customers at dozens of tables surrounded by big-screen TV screens showing sports. Some nights there is live music. Most tables overlook the golf area. People can and often do go from table to tee taking turns with their shots. 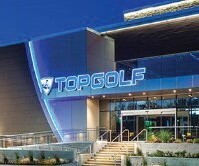 Topgolf has a total of 102 hitting bays on three levels for players to aim at 11 golf targets shaped like greens. The micro-chipped balls are identified with each player so that points can be tallied in a variety of games, with scores electronically posted. “The best way to describe it is that it’s a combination of bowling, darts and golf, mostly golf,” Olberding said. The bays cost $20 an hour until 6 p.m. on Mondays through Thursdays and until noon on weekends. Rates then go to $40 hourly until closing at midnight or 2 a.m. Up to six people can play during each game. The targets are between 25 and 185 yards out. “It’s more of a practice range than a driving range,” Olberding said. Topgolf has PGA professionals on staff to give lessons, she said. Players can bring their own clubs to Topgolf or use ones available free of charge. The clubs and balls are provided by Callaway, the official Topgolf partner. Topgolf has 25 open or nearly open locations around the United States, according to its website. Olberding said Topgolf is helping the future of golf by exposing so many new people to the game. The popularity of Topgolf can mean long waits to hit balls at peak times. In San Antonio, people have waited three to five hours, Olberding said. That would be a long time to eat and drink but people can get on the wait list, leave and then be called when their turn is near, she said. Crowds are usually lightest when Topgolf first opens, which is at 9 a.m. daily except Saturday, when it opens at 8 a.m.
Topgolf is popular for birthday parties, bachelor parties, corporate outings and other group events, Olberding said. Buffets can be set up for those events. 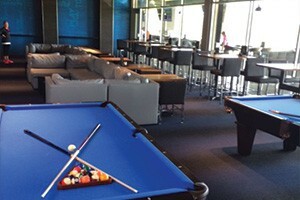 Topgolf offers various monthly membership programs with unlimited play during certain hours. While the real game of golf can be aggravating at times, Olberding said Topgolf is meant to be fun. “You don’t have to take yourself seriously by any means,” she said. Deer Creek Golf Club in Overland Park has always provided top-notch golf but not necessary consistent conditions or service. That has changed this year under new management committed to making course playability and clubhouse service daily standards, said Chris Fink, who took over as Deer Creek general manager on Jan. 1. Deer Creek, now operated by the national golf course management company Eagle Golf, has added new staff and changed the culture to emphasize consistency, Fink said. On the course, greens are rolling at about the same speed every day, Fink said. More attention is given to keeping bunkers, tees and fairways tidy. Beverage carts and marshals are out daily. In the clubhouse, breakfast is available each morning. 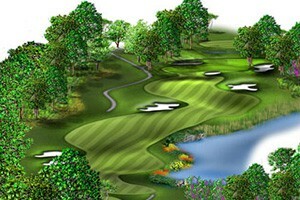 Deer Creek’s fairways meander through tall trees, cross the creek several times and offer a mix of woods and housing on both the front and back nine. 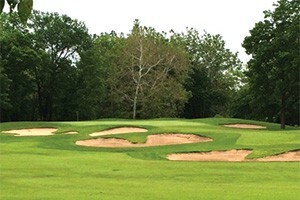 The course plays 6,800 yards from the back tee and has some 85 bunkers. Information on the course, its amenities, green fees and tee times is available at www.deercreekgc.com or by calling 913-681-3100. Deer Creek has become more affordable over the years, with prime weekend fees of $65 with cart and various discounts available during the week and late in the afternoon. The senior rate of $29 with cart is among the cheapest in Kansas City. The course also sells annual passes and punch cards for discounted rounds. Fink said the new management has made efforts to speed up play at Deer Creek because golf is losing some popularity due to how much time it takes to play. The course has put some “ready golf” tips on every cart tag. “If you shave just one minute off the time to play each hole that is about 20 minutes for the round,” Fink said. 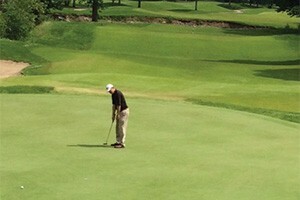 The course pays attention to pin positions as a way to get players off the green faster and it encourages golfers to give competitors short putts. Moving tees up does not always accelerate play because it may tempt players to clear trouble, only to land it there anyway and take longer to play the hole, he said. Deer Creek is not only known for its golf course but for its large clubhouse, which overlooks the first tee and ninth and 18th greens. 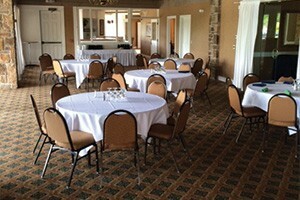 The clubhouse is popular for corporate meetings, seminars banquets, reunions and weddings. There are about 70 weddings booked for 2015, about half of them on the first tee, Fink said. There are two banquet rooms in the clubhouse for receptions and other events. 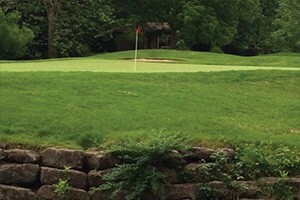 Deer Creek is also one of the preferred courses in Kansas City for corporate and charitable tournaments because of the clubhouse and top-rated golf course. Money was invested this year in new carpeting and restrooms and to upgrade art on some of the event space walls in the clubhouse, Fink said. Fink said improvements to the golf and clubhouse experience at Deer Creek will continue. Strategy is a major part of golf, regardless of your skill level. While you are responsible for controlling the distance, direction and trajectory of the golf ball, it is also important to make the right decisions throughout your round. Those decisions can start as early as the parking lot – perhaps swapping out a fairway wood to add another wedge option when you are playing a shorter course with challenging green complexes. When you make the right decisions, you increase the likelihood of a solid round and lower score. 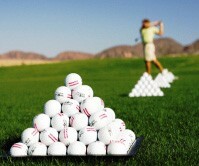 Many amateurs do not realize how far they actually hit the ball. In fact, they swing as hard as they can rather than try to learn a consistent distance for each club. 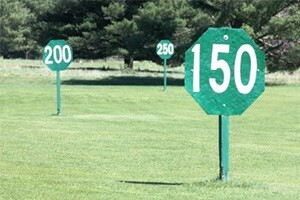 Better players know exactly how far they hit each club, and how to hit each club different distances. Pay careful attention to the difference between carry distance and overall distance. In addition, make sure you realize how far you carry the ball with each club in the event of a forced carry. There is no set distance that men or women should hit each club. Just because your friends hit an 8 iron 150 yards does not mean you should hit your 8 iron the same distance. When the shot comes up short there are several excuses such as poor contact or wind. In reality, the player does not hit the shot the intended distance. Learn how far the ball will go with a smooth, consistent and repetitive swing. Selecting the wrong club is one of the most common mistakes many amateurs make so dial in your distances on the range and don’t just grab what others are playing. Unlike Tin Cup, you do not always have to go for it. Phil Mickelson hits some of the most amazing flop shots. Bubba is known for the miraculous shot from the trees to set up his Masters victory. However, when an elite player sets up to hit a shot, the result is not just a lucky shot. They have practiced and hit these types of shots thousands of times. When an amateur pulls off a similar shot, it is extremely lucky. When you encounter the next challenge such as a drivable par 4, reachable par 5 or even recovery shot from trees, play the percentages. Lay up, hit the green in regulation and make a stress free easy par or birdie. Master’s Champions commonly reach the par 5’s in 2 and score eagles and birdies on their way to victory. Zach Johnson broke the trend and won the Masters by laying up on every par 5 while he still birdied a high percentage of the holes. Johnson executed his plan nearly to perfection. Playing within your ability is crucial to posting lower scores. Think to yourself, if I hit this shot 10 times, how many times would I successfully pull off this shot? Then decide if it is worth it and play the high percentage shot. 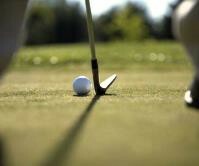 Elite players do not hit the ball as far as they can on every tee shot. Rather, they play to their strength and typically play the high percentage shot. Develop a game plan before the start of each hole. Plan the hole according to your strength. Would you prefer to hit a 100 yard shot instead of a difficult 30 yard pitch? Pin position can dictate the difficulty of each shot. Rather than just bombing a driver to 30 yards, lay up with a 3 wood and leave a full wedge into the green. Play smart, keep the ball in play. Hit to the safe part of the green rather than go directly at every pin. If you hit a high percentage of fairways and greens in regulation you should see lower scores while avoiding big numbers such as double bogey or worse. Plan to hit shots from a comfortable distance and make your round easy and stress free. 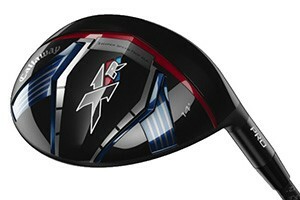 Given the variety of fairway woods available today, selecting the right one for your game is a challenge. There are many questions you have to answer before you can make the final decision. Although the variety does ensure one thing: you can find the best possible fairway wood for your needs. With the best in the business creating fairway woods and hybrids, you can rest assured you will find one to enhance your game and deliver the results you expect. 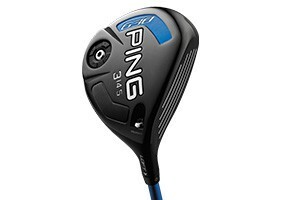 The Ping G30 is one of the best fairway woods available on the market today, hands down. It not only allows you to generate more speed but also lowers spin, ensuring greater accuracy on your shots. The G30 is a definite step up on the G25 which, in its own right, was a very good club and enjoyed significant popularity. When it comes to performance on the fairway, you cannot get much better than the Ping G30. Even lazy swings and issues in technique can be covered by using this great club. The accuracy is such that you can expect decent elevation on shots hit from anywhere. When coupled with the smooth feel and the great sound the club produces at impact, you have on your hands a formidable tool to take on par-5s in two. On top of all that, the club looks great as well. Its visual appeal makes it a delight to play. If forgiveness is the feature you are looking for when selecting a fairway wood, the Callaway XR Pro is a great choice. The club is great for all golfers, offering more speed off the clubface coupled with ample forgiveness. These two hallmarks of Callaway long clubs combine to enable you to get greater distance on your shots and be able to find it. The head shape of the club has been redesigned to make it better when hitting off the tee, making it versatile club to have in your bag. In Golf Digest’s Hot List, the club earned five stars out of five, making it the only club this year to receive a perfect rating in its class. 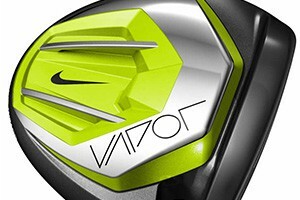 The Nike Vapor series offers a couple of outstanding fairways woods, the Speed and the Flex. The Flex offers a range of adjustment and customization options, but the Speed is great to use off the shelf. The Speed features a larger head, offering greater distance and speed on your shots. Also, it is more forgiving, enabling you to lift your game and take more risks. The Flex, on the other hand, can be fitted according to your needs, making it the ideal fairway wood if you have some specific requirements. The smaller head provides more playability and makes it more effective from a broader variety of lies. Overall, the Speed and Flex are considerable improvements over previous models from Nike. The Titleist 915F may lack some of the innovative features of the other fairway woods on this list, but that doesn’t make it a lesser club. The company has retained the hosel design which it introduced in the 913 series while blending several improvements throughout the rest of the club, including designing a larger, more forgiving head to make any shot easier to execute. While offerings from Titleist are typically considered a better player’s club, it offers more forgiveness than the fairway woods than their prior offerings, making it a worthy inclusion on the list of the best fairway woods of 2015. 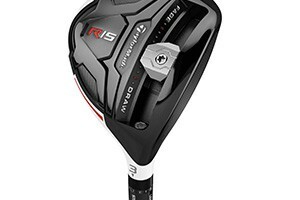 The R15 fairway wood brings something brand new to the category with the sliding weight along the sole of the club. Positioning the weight at the heel, toe, or in the middle can change the overall bias of the club, promoting a draw, a fade, or putting mass directly behind the ball to maximize distance. The track also acts as a speed pocket – a feature seen in other clubs to allow the face to flex more and provide more distance. They feature the same adjustable hosel seen on the R15 driver, making it the most adjustable club in this category. These are the five latest fairway woods from the leading golf equipment manufacturers. If you want to buy a fairway wood that offers precision, distance, height, class, and forgiveness, your best bet is to find a fitter to help you select the best club to fit your game and provide the distance you need. Which isn’t to say you always want the longest fairway wood you can find. In testing, some golfers felt that some of these clubs nearly matched the distance of their driver, meaning they could probably go with a higher loft and a little less distance to capitalize on the control of the club and provide more precision when needed off the tee.